LONDON, BIOT - July 19, 2018 - PRLog -- Over 31,536,00 seconds, 525,600 minutes, 8,760 hours, 365 days, 55 weeks and 12 months since the last fiesta. 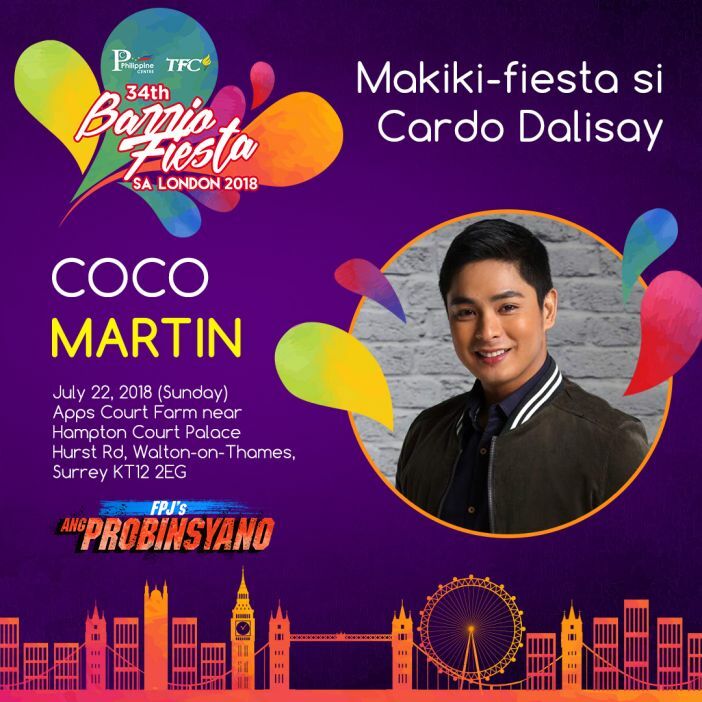 The wait will soon be over as the 34th installment of the biggest Filipino festival, "London Barrio Fiesta" (LBF) happens on July 21 and 22, at the Hampton Court Palace Hurst Rd., at Walton-on-Thames in Surrey. Since the LBF started in 1984 and the partnership with TFC sealed in 2010, the yearly festivities has seen record crowds gather to be with kababayans and see the likes of the Philippines' Phenomenal Star Vice Ganda, Philippines Concert King Martin Nievera, love teams Kim Chiu and Xian Lim and Total Performer Gary Valenciano. The anticipation is high as Philippine Centre and The Filipino Channel (TFC) leave no stone unturned and preparations are made worthy of the anticipation for the return of the LBF after a year's hiatus, an with an equally blockbuster ensemble. A day before the fiesta, Filipinos from United Kingdom and nearby cities are excited to see their kababayans for day one on July 21 and see one the most celebrated performers in the Philippines "Singer 2018" finalist KZ Tandingan and the LBF comeback of Rockoustic Princess Yeng Constantino, known worldwide as well for her TFC performances, including the LBF. Young Pinoys are as excited as LBF unveils the first-time participation of one of the most popular Philippine loveteams today, Trending Tandem Maymay Entrata and Edward Barbers, more popularly known as MayWard. Joining MayWard on day two is another trendsetter, Inigo Pascual, the first Filipino artist to hit the Philippine Billboard 100 for his song "Dahil Sa 'Yo" (Filipino phrase that means because of you). On day two, Filipinos in UK and nearby cities are ready to welcome more kababayans and the all-star cast of the Philippines' top-rating and one of the longest-running series "Ang Probinsyano". Leading the action-packed day two is Coco Martin. Joining him are iconic action star Lito Lapid and real-life son Mark Lapid, and fast-rising comedian PJ Endrinal. Pumping up the adrenalin on day two are Dancefloor Dynamite John Pratts and Princess Yasmin Pressman, Martin's (as the indomitable policeman Cardo) good friend (Jerome) and lady love (Alyanna). This year's on-ground activities are themed #JustLoveArawAraw, patterned after ABS-CBN's summer entertainment caravan that has spanned the world.On top of the entertainment showcase featuring the two-day celebrity performances, LBF ups the ante this year as it features a sports area where free eskrima and arnis (ancient Filipino art of martial arts) workshop from the Dose Pares booth, one of the oldest Filipino organizations that teach Philippine martial arts, will be conducted. Meanwhile the entertainment arena will open a search for the Little Cardo and Alyana at the entertainment booth; a chance to win at the Spin-It-To-Win-It game at TFC booth; and special discounts at the TFC merchandise booth with "Just Love Araw-Araw" shirts. Douse the anticipation. Join the biggest gathering of the Filipinos in Europe on July 21 and 22 at the Hampton Court, Hurst Road, Walton-on-Thames, Surrey, KT12 2EG. Tickets are at L5 for General Admission (free photo booth session, special discounts and express entry to the main gate) and VIP L45 (with group photo op or pass, special discounts, front stage seats and express entry to main gates). Promos are available. Buy five general admission tickets for £15 and save £10! If you are a TFC subscriber, get two tickets free and for every purchase of two more tickets, get a special rate of £2.50 per ticket. The same special rate applies for myREMIT subscribers who get one free ticket each. Tickets will also be available at the venue on the day of the event. Follow KapamilyaTFC and KapamilyaGlobalPR via Facebook, Twitter and Instagram.